Dermatophytosis is the medical name for ringworm. Ringworm is a contagious disease that animals get from each other, from humans or from the environment (soil or dust and hair). One variety is carried by rats and mice so dogs and cats who are good mousers or rat catchers might be infected by hunting. The origin of the term “ringworm” dates back to the middle ages when people did not know the cause of the disease. Sometimes humans get ring shaped areas of redness and animals get round areas of hair loss and crusting – hence the “ring” part of the disease name. Today we know that ringworm has nothing at all to do with worms or parasites. It is a fungus (not a worm!). How do you know if my cat or dog has ringworm? How ringworm in dogs and cats presents is individual and can vary a lot, from small patches of hair loss that do not bother the pet at all, to total body redness, hair loss and thick crusting. It may or may not be itchy. To try and work out if ringworm is the cause of the problem, there are several different tests and techniques we can use. One is to pluck out some hairs or brush the animal with a toothbrush to collect hairs, and culture these hairs. If there is fungus present, it will grow in the laboratory. We can also use an ultraviolet lamp to look at the hair on the animal, and if it is one particular type of fungus (Microsporum canis), it may glow apple green under the lamp. Not all types of fungus glow however. We can also look at hairs under the microscope to try and find the fungus. Sometimes the quickest and best way to diagnose ringworm is to take a biopsy from the edge of the affected skin. If the fungus is seen in the biopsy samples, we have an answer and can be sure that treatment is needed. How do vets treat ringworm in dogs and cats? Ringworm in dogs and cats can be a frustrating and difficult disease to treat, especially when there are other pets in the environment. If a household with multiple cats or a cattery is affected, controlling disease is a major undertaking. Fungal infections can take a while to treat – the general rule is to continue treatment until two months after the first negative culture result. If ringworm is diagnosed, there are three key areas to consider when treating it. Treat the pet – use the cream, shampoo and/or tablets that have been prescribed, and clip the fur of long haired cats until it is about 1cm long (since the fungus lives in the hair shaft, getting rid of the hair also gets rid of the fungus). Destroy or dispose of the clipped off hairs. It is important for the vet to check that your cat or dog is in good health otherwise and eating a balanced diet so they are in good shape to fight off the infection. If you have other pets, they may also need to be treated or isolated. Decontaminate the environment. The infective fungal spores can live in the environment for up to 2 years. They are protected within hairs that have fallen off the pet. The house will need top to toe cleaning, including vacuuming thoroughly as regularly as possible. Soft bedding or rugs/carpets that the pet sleeps on should ideally be destroyed, otherwise steam cleaning with water over 44C or washing with bleach may help. Clean all wipable/moppable surfaces that can be cleaned with bleach (be careful as bleach will discolour fabrics). 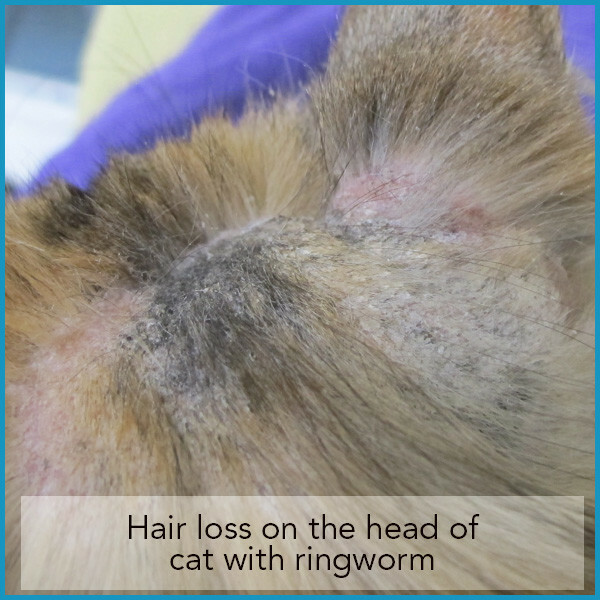 Some cases of mild localised ringworm may get better on their own, however it has been known for long haired cats to take up to 4 years to clear the infection without treatment! Can I catch ringworm from my dog/cat? Yes! Ringworm is a zoonosis, ie it can be transmitted from pets to humans and vice versa. If any humans have ring-shaped areas of redness or itchy patches, please advise your doctor and let them know that your pet has been diagnosed with ringworm.